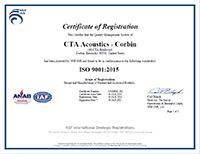 CTA Acoustics, Inc. holds International Standards Organization (ISO) 9001 and IATF 16949 Quality Management Systems for manufacturing operations in Corbin, Kentucky, warehousing in Orland, Indiana and customer-focused facility in Madison Heights, Michigan. This specification aligns existing automotive quality system requirements within the global automotive industry. It also specifies the quality system requirements for the design, development, production, installation and servicing of automotive-related products. 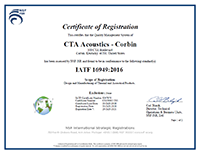 The scope of this certification applies to the design, development and manufacturing of thermal and acoustical products. 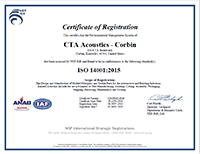 CTA Acoustics also holds ISO 14001:2015 Environmental Management Systems for manufacturing operations in Corbin, Kentucky. The scope of this certification applies to the design and manufacturing of molded fiberglass and textile parts for the automotive and building industries. NSF International Strategic Registrations, an accredited independent auditing firm for ISO registration worldwide, conducted the audits.